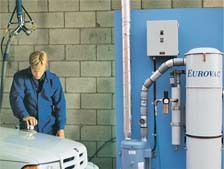 Eurovac has been in the dust and fume extraction business for over 20 years. Eurovac specializes in building the most dependable and cost-effective Source Capture Dust Extraction, Vacuum Housekeeping & Detailing, Welding Source Capture, and Vehicle Exhaust Systems on the market today. Since 1984, when Eurovac pioneered Body Shop Dust Extraction Systems in North America with the introduction of the Eurovac Mark I, leading Body Shops have enjoyed all the benefits of dust-free working conditions… and saved money at the same time!